Having back-to-back number 1 hits is not unusual - plenty of acts have done it over the years. An artist having two consecutive number 1 songs in the top 10 at the same time has also happened more than once - we saw it in my 30 Years Ago... posts last year when Madonna replaced herself at the top. 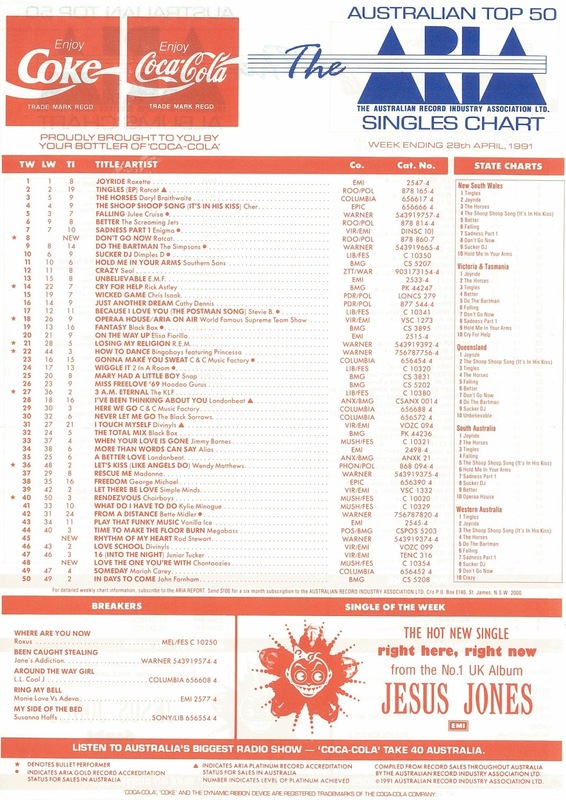 But, 25 years ago this week, something rare happened on the ARIA singles chart (not even Justin Bieber did it recently with his chart-hogging slew of singles). A band had two songs simultaneously in the top 10 - and although both would be number 1 hits, neither had yet reached the top. There was only a week in it, since the earlier of the two singles was just seven days away from being number 1. Until then, Roxette spent their third week on top with "Joyride" this week in 1991. This debut single, which features samples from tracks by Lyn Collins, Bill Withers and Orange Crush, was a top 3 smash in the US, but flew under the radar in Australia. Their one-time bandmate Norman Cook did it with Beats International, and former Housemartins Paul Heaton and Dave Hemmingway also topped the UK chart with this lead single from second album Choke. The song's clip won the BRIT Award for Best Video. This track from New Jack City spent three months in the lower end of the ARIA top 100. Actor/rapper Ice-T appeared in the movie as a detective out to stop Nino Brown, the drug dealer played by Wesley Snipes mentioned in the title. It was beginning to look a lot like 1989's top 20 hit "Blush" had been a fluke for indie band The Hummingbirds, who placed their third consecutive single in the 70s, despite "If A Vow" being the first track lifted from second album Va Va Voom. The story of Jane's Addiction is a fascinating one - and one that's bound to end up as a book and/or film some day. 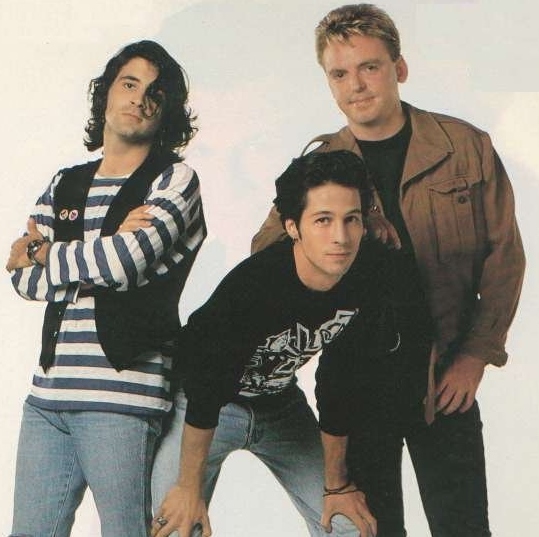 With '80s rock on the wane, the band comprised of singer Perry Farrell, guitarist Dave Navarro, bassist Eric Avery and drummer Stephen Perkins were at the forefront of '90s alternative rock, launching and headlining the first Lollapalooza festival, releasing their breakthrough album, Ritual De Lo Habitual, amid a sea of drug abuse and in-fighting, and spectacularly self-destructing while on the road. "Been Caught Stealing" is easily the band's best-known track, and despite not making much of a mark on mainstream charts, it was a number 1 hit on Billboard's Modern Rock Tracks chart, while its shoplifting-themed music video was an MTV staple. By the end of the year, however, the band had broken up. Following their string of hits in 1987-88, Chantoozies had been finding it hard to return to the top 50 - and even more of a challenge hanging onto band members, with the initial line-up of eight reduced to just three singers: Ally Fowler, Angie La Bozzetta and Eve von Bibra. Solution: release a cover version. The trio's pop take on the much-covered "Love The One You're With" (originally recorded by Stephen Stills) was a return to form and narrowly missed out on becoming Chantoozies' third top 20 hit. Unfortunately, second album Gild The Lily didn't reach the top 50, a follow-up remake of The Jackson 5's "I'll Be There" bombed out completely and three became zero by the end of the year. That wasn't quite the end of the story, with the female members reuniting every so often to release a new song or, as they did earlier in 2016, support Bananarama on a national tour. I've spoken before (here and here) about my hatred for Rod Stewart's musical output in the late '80s and early '90s - but this was the song that was the final nail in the coffin. "Rhythm Of My Heart" was his fifth cover version in a row - this time of an album track by Dutch performer René Shuman - with a melody based on traditional Scottish song "Loch Lamond". Sounding like an overblown national anthem, the track was the first single proper from Rod's Vagabond Heart album and was mercifully kept from the top of the ARIA chart by "The Grease Megamix". Here's the band responsible for two future chart-toppers on this week's ARIA top 50, with "Don't Go Now" joining the incredibly persistent Tingles EP in the top 10. In just a few months, the Sydney band had gone from virtual unknowns to one of the most popular acts in the country - and nothing summed that up more than the number 8 debut of "Don't Go Now" in its first week in the entire top 100. Decidedly poppier than Tingles lead track "That Ain't Bad", "Don't Go Now" maintained the band's jangly guitar sound - and suggested the band had found the perfect marriage between indie cred and mainstream sensibility. For the time being, anyway. Providing backing vocals on "Don't Go Now" was Margaret Urlich, who could be heard on another future number 1 single, "The Horses", which was also sitting inside the top 10 this week in 1991. Next week: Pet Shop Boys commit sacrilege - and I loved it. Plus, two new rap hits reach the top 50. 'Hold You Tight' is a song I knew primarily through American Top 40. I like 'A Little Time', but it doesn't sound at all like a UK #1 in 1991. Maybe that was the appeal? I've uploaded a better copy of the 'If a Vow' video here - https://www.youtube.com/watch?v=ZmmWkxrs2hc . I love how 'Love the One You're With' appears on an 'Absolutely 80s' youtube channel. Fast Forward parodied it with "Sing a 60's Hit", featuring the memorable line (for me, anyway) in one of the verses, "Can't remember when we last had hits." Never knew 'Rhythm of My Heart' was a cover. I don't like it much at all, either. 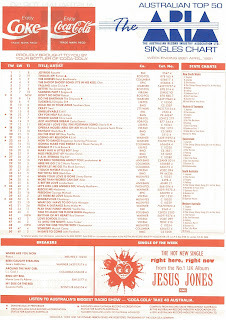 Ratcat's ascent to the top of the singles chart - twice - surely heralded the arrival of 'alternative' music becoming commercial in Australia. Short-lived music video program 'Power Cuts', which started around this time in 1991 (or in March), also aired the 'Alternative Top 10' countdown, featuring acts such as Ratcat, Clouds, and others who would eventually crack the top 50 in the coming months/years. Hold You Tight was a song I was only familiar with by listening to the American TOP 40 with Rick Dees (I Think?). Good to see it charted, at least. And to hear it again after all these years. Another song I thought should've been bigger than it obviously was. The Beautiful South do have a cult following but i'm unfamiliar with them in general. A Little Time however is probly their most known track being a former UK #1. I sometimes cringe that Ice-T has so many TOP 100 entries because by himself he just doesn't do much for me. New Jack Hustle is just an example of this. Been Caught Stealing still gets flogged on music television because of that iconic video. The song itself is mediocre imo. Chantoozies' cover of Love The One You're With is pretty good considering their previous efforts for me. I still do prefer the original though. Sorry but I like crooning Rod Stewart and liked Rhythm Of My Heart. Don't Go Now was still getting flogged well into the 00's, don't hear it much these days. I still think (but am undecided depending on mood) I like That Ain't Bad more. But I think it's only because I still hear that a lot more than this. It's a cool track but the video still shits me, wished they'd put more effort into that and made it more memorable.